All-star season ended tonight for Blake. We lost in the semi-finals. Again. I am so proud of this kid for giving 100% at every practice and game. I am so proud of him for keeping his head up game after game waiting for his turn to play. I am so proud of him for making good plays when he was in the game. I am so proud of him for improving throughout the summer. 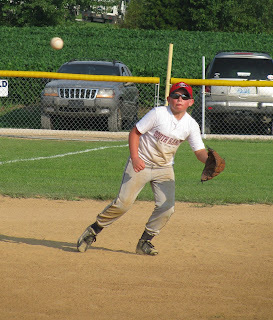 I am so proud of him for all the RBIs he batted in and for all the steals he was able to make. I am so proud of him for even trying out for the all-star team. It was a rough season. It wasn't always a fun season, but he hung in there. He never gave up. He set a great example for Kevin. Way to go Blake. Hey Amy, that would make a great page! LOVE this post about Blake! What a fun way for him to remember how much you love him.